Ten months into its Broadway run, David Yazbek and Itamar Moses’s Tony-winning musical remains quietly ravishing: It seems to have almost as much silence as music, and it trusts us to fill in the blanks. Sasson Gabay now stars as Tewfiq, the conductor of an Egyptian band stranded in an Israeli desert town—the role he played in the film from which the show is adapted. His performance is bone-dry and bone-deep, and his scenes with the stunning Katrina Lenk retain the delicate balance she had opposite Tony Shalhoub, with a slight shift in emphasis: Gabay has a more somber and paternal presence, which casts his relationship with wayward trumpet player Haled (Ari'el Stachel) into clearer relief. The richness of the writing, the nuances of David Cromer’s production and the continued excellence of the ensemble cast make each return visit a pleasure. In a musical that is full of beautiful moments, perhaps the loveliest is the one shared on a plain park bench by Dina (Katrina Lenk), an Israeli café owner, and Tewfiq (Tony Shalhoub), an Egyptian bandleader stranded for the night in her uneventful desert town in 1996. As members of his ceremonial police orchestra play incidental music behind them, Dina asks Tewfiq how it feels to be a conductor. They each raise their arms, inhabiting an imagined experience together, and the music we have been hearing stops; what they feel is realer, and we are invited to imagine it with them. To entrust such a moment to silence is an unusual choice for a musical. 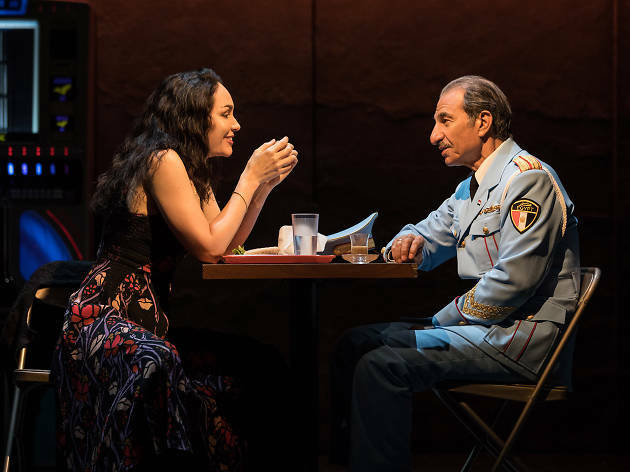 But The Band’s Visit, which seems even richer on Broadway than in its award-winning 2016 run at the Atlantic, is unconventionally wise. It is rare to encounter a show that has such a graceful sense of time. Itamar Moses’s book, adapted from a 2007 Israeli film, embraces the unspoken; the characters use English as a second language, which gives the dialogue a tentative, searching quality that draws us closer. And David Yazbek’s Middle Eastern–accented score, orchestrated by Jamshied Sharifi, includes not only wryly witty character songs but also joyous instrumentals for oud, cello, violin, clarinet and darbouka. 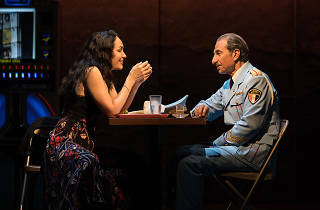 When we meet the Israelis, they are adrift on the central turntable of Scott Pask’s set, waiting for anything to happen—“just something different.” Bittersweet and built for adults, The Band’s Visit is certainly different from most modern musicals. Will Broadway audiences show it the hospitality it deserves? That’s the challenge this production offers, a line it draws gently in the shifting sand. Ethel Barrymore Theatre (Broadway). Music and lyrics by David Yazbek. Book by Itamar Moses. Directed by David Cromer. With Katrina Lenk, Tony Shalhoub. Running time: 1hr 35mins. No intermission. Note: Sasson Gabay, who played the role of Tewfiq in the original film, now plays him onstage, replacing Tony Shalhoub. Horrible. I’d give it 0 stars if they let me. I’ve watched many musicals and plays and never wanted to walk out of one until I watched this one. Painfully slow, boring, unlike able characters, and sub par music. The highlight of the performance was probably at the end after it ended and the band played a little music. Dumbfounded as to how it won so many awards! The most magical musical I've seen in a long time. Beautifully spun from an incident that we're told, in a self-deprecating way, "probably wasn't very important", we see the best side of human relationships - people being hopeful, witty, helpful, tender and loving. It's actually a story about the most important thing of all - that which makes us human. one of the worst musicals I have ever seen! there is no cohesion in the story, the dialogues are poorly written and mundane, the singers/actors are just okay, it is hard to believe how it got so many awards! Yes the concept is really strong but it did not look like they took advantage of the idea at all . This gave me the " I want my money back" feeling I usually do not get even from the worst shows. It's unfair that this show has not had more comments. It is indeed painfully slow--that is the point, as I see it; the empty lives, the harsh landscape, and ranged against them, the dreams, and the music. I enjoyed the movie, even though it wasn't really my cup of tea and was very, very painfully slow at times, but I felt that I had to go see the stage play version, I thought it would be cool and hoped it would have been a bit better. I won't bash on the actors, they were just fine in their roles. I really didn't even want to stay for the entire thing, but felt leaving early would have been wasting my hard earned money and I like to stay til the ends of movies and plays!.